This New Whiskey Is Flavored With Beaver. Yes, Like the Animal. Whiskey's not for everyone. Some prefer beer, others prefer booze that tastes like soda (Coca-Cola is making alcohol now after all). But maybe what we're all really looking for is liquor flavored with the secretions of semiaquatic mammals. How can we know until we've tried? And now we can try: Tamworth Distilling and Mercantile is releasing a limited-edition beaver whiskey called Eau de Musc ("Water of Musk"). Basically, it's 88-proof two-year-aged bourbon whiskey infused with castoreum. What's castoreum? Keep an open mind here: It's the oil in the beaver's castor sacs, just below that delightfully flat tail. It's partially used to mark territory. And if you're feeling judgmental about this right now, keep in mind that you used to drink Four Loko. Plus, there's a lot of precedent for using castoreum in food and perfume. "I have always been intrigued by the use of castoreum in food and luxury products," said Steven Grasse, head distiller of Tamworth Distilling and Mercantile. "There was a time when it was ubiquitous and used widely as a flavoring agent and in perfume. In fact, it’s still used in a number of products today and considered by the F.D.A. to be a 'Natural Flavoring.' I was curious what would it taste like in one of our unreleased bourbons from Tamworth Distilling -- so we tried it, and it worked beautifully." According to a press release, "it exudes a leathery, raspberry taste, and acts to fortify the whiskey flavors." 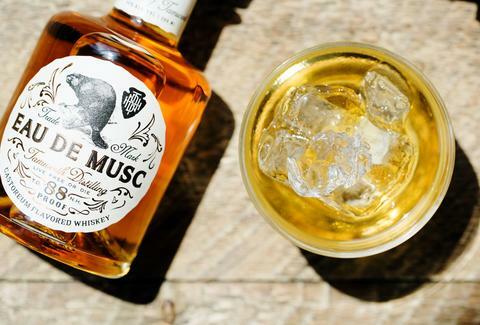 But ti won't be around forever: Eau de Musc is a limited-edition release that comes in a 200ml vintage-style perfume bottle that you can pick up for $65 from Warehouse Wines and Spirits. Even if this isn't the thing that convinces you to love whiskey, we're pretty sure you've never had anything quite like it.